If you are a car aficionado, you always look forward to the beginning of a new year due to the sole fact that all high-end manufacturers release new luxury vehicles at the major international auto shows. Currently, the Geneva International Motor Show is taking place, and the vehicles being unveiled certainly do not disappoint. Perhaps the most anticipated release is Maserati’s latest innovation: the Levante, the first-ever SUV released by the Italian car company. 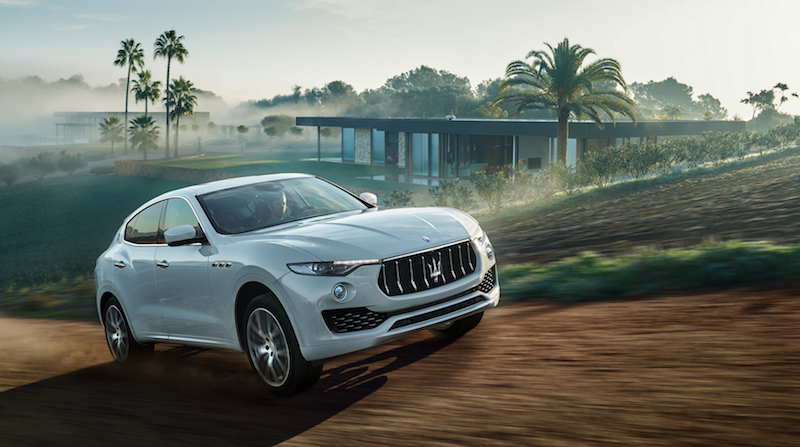 The Levante is the perfection combination of Maserati’s sleek features mixed with the power of an SUV, and the name behind it is quite fitting as well. According to luxury manufacturer’s website, the word levante represents the “warm Mediterranean wind that can change from a light breeze to an irresistible natural force in an instant.” An accurate representation of what their latest design embodies. From the interior to the exterior, the Levante is an elite presence. The interior offers classic and premium Maserati features and is often referred to resembling “a first-class lounge,” according to the company. Interior features include the iconic analog clock on the dashboard, an 8.4-inch touchscreen, panoramic sunroof, adequate seating for passengers and a comfort seat setting for the driver’s chair, which can adjust to various settings such as height, depth and seat angle. To upgrade your interior even more so, Maserati offers two premium packages: the sport package, which will transform your car to showcase the sportier side of the company with electric sport seats, a sport adjustable steering wheel, brushed steel sport pedals and more; and the luxury pack, which includes premium leather or Ermenegildo Zegna leather (an additional package), Harman Kardon audio system, wood trim and more. The exterior of the Levante boasts a strong presence, but still tying back to the classic and coveted look of a Maserati. The shell of the vehicle is undeniably sleek. The front-end has three grills, the largest one showcasing the treasured trident emblem that Maserati owners know and love, while the back-end of the luxury auto has four exhausts and a spoiler perfectly placed above the rear window. The Levante runs on a twin turbo V6 engine and can go from zero to 60 in 5.2 seconds. It also can reach up to 430-horsepower and is built with an 8-speed automatic transmission. Other exterior additives the Levante has is LED headlights, camera capabilities, Adaptive Lighting modes and Air Shutter to control the airflow to the engine. The Levante also comes in 13 colors including black, white, metallic gray and champagne. While the Levante was unveiled earlier this week, it will not hit the European market until May. Unfortunately for American buyers, we will have to wait a little bit longer to sit behind the wheel of this gem as the Levante won’t hit stateside until this upcoming fall. The good news? American buyers can see the Levante up close and personal at the New York International Auto Show, which is being held at the Javits Center in New York City from March 25 to April 3. To learn more about the Levante, please visit www.maserati.com. To see the unveiling of the Levante, please reference the video below!